I am writing today to express my adamant opposition to Senate Bill 564. This bill proposes to privatize the State Printing Office. The State Printing Office has long been a critical component of state government, especially in maintaining the efficiencies of the legislature during legislative sessions. This office is comprised of many highly trained print tradesmen who, if this bill should pass, would be lost to private industry, and who could not be replaced. Currently in Nevada, there are NO apprenticeships or training programs offered in this field. If this legislation should pass, legislators would find themselves at the mercy of outside printers who may or may not be able to meet the needs of the legislature and the public. During our yearly political convention, the issue of privatization of the State Printing Office was discussed by the delegates in attendance. A resolution in opposition to this proposal was unanimously passed by that body. With that, on behalf of the 120 different local unions consisting of 155,000 members of the Nevada State AFL-CIO, I request that you vote NO on this misguided legislation. This proposal was developed as part of the Fundamental Review of State Government. We are well aware of the fiscal needs of the State of Nevada. However, attempting to solve budget shortfalls through privatization is viewed as nothing more than a union-busting attempt by the proponents of this measure. HEARING UPDATE (April 6, 2001)  Senate Bill 564 was heard by the Senate Government Affairs Committee on Friday, April 6. Criticism was bi-partisan. The senior members of the upper house, Sens. Joe Neal, D-North Las Vegas, and Bill Raggio, R-Reno, asked tough questions of State Dept. of Administration chief Perry Comeaux. Neal wanted to know who asked for the bill and if the Guinn administration had bothered to discuss the proposal with anyone at the legislature. Comeaux said it was part of the governor's initiative to streamline government and that the legislature had not been consulted. Neal termed that a trespass upon constitutional separation of powers. Raggio praised the service the printshop gives the legislature and asked Comeaux and state printer Don Bailey for information justifying the proposal, including how other states handle their printing. Raggio asked where were the private sector printers willing to bid. No major printshops operate in the capital. An owner of a small Carson City printery stood up and noted he was not prepared to address the issues but might have interest in some of the work. Press operator and union member Bruce Meyer provided the committee with insight as to the degree of care taken with the state's work. "I know commercial printers who have told me that as long as they have a signed proof, they'll print anything," Meyer stated. He emphasized the great care taken with the state's work, adding that the experience of the workers catches a lot of errors before they make it to the printed page. Meyer stated that he personally caught major mistakes in the 2001 Legislative Manual which would have resulted in the need to reprint the entire run had he not taken the initiative. Meyer's comments were underscored by Jeanette Bloom, Clerk of the Nevada Supreme Court. She noted the need for experienced printers to facilitate the confidential and accurate handling of the decisions of the state's highest judicial body. She noted that while there might be printers willing to bid on some of the printshop's other work, "there are only two printers of legal decisions in the country." Both West Publishing and Lexis/Nexis are foreign owned with printing facilities in eastern states, Ms. Bloom stated. She added that the court worried about private printers "trying to copyright our headnotes and even our page numbers." Nevada State AFL-CIO Executive Secretary-Treasurer Danny Thompson explained to Sen. Raggio that a drain of the shop's work would eventually result in layoffs of experienced workers who would not return when the legislature goes into session and printing demand peaks. The committee took no action on the bill pending the receipt of additional information. HEARING UPDATE (Monday, April 16, 2001)  Senate Bill 564 was officially killed by a 5-2 vote. Sen. Dina Titus, D-Las Vegas, moved to "indefinitely postpone" the measure, which is a nice way of saying drive a stake through its heart. Sen. Neal seconded the motion. Sen. Raggio stated that although he normally favors such measures, this one could send the wrong message. Sen. Raggio thus joined the five member majority to kill the bill. Sen. Terry Care, D-Las Vegas, and Sen. Jon Porter, R-Henderson, voted "yes" on Sen. Titus' motion. Government Affairs Committee Chair Ann O'Connell, and Sen. Bill O'Donnell, both R-Las Vegas, voted against the motion. WARNING TO THE WISE: This legislative drama is just like a teen horror movie. The beast can always come back from the dead in the form of an amendment to some other bill later in the session. We can't feel confident until the legislature has adjourned in June. So stay in touch, stay alert and share information. Click here to locate the Nevada Senator representing your area. Click here to locate the Nevada Assemblymember representing your area. TO CALL THE LEDGE LOCALLY FROM LAS VEGAS: (702) 486-2626. FROM NORTHWESTERN NEVADA: (775) 684-6789. TO FAX ANY ASSEMBLYMEMBER: (775) 684-8533. TO FAX ANY SENATOR: (775) 684-6522. I am writing to express my heartfelt opposition to Senate Bill 564. I was troubled but not surprised that private interests seeking financial gain were able to convince the administration to submit this measure to privatize state printing. To us, it's an old story. 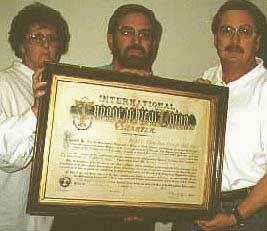 CWA LOCAL 9413 OFFICERS WITH THE WASHOE TYPOGRAPHICAL UNION'S 1876 CHARTER. It replaced the 1863 original which was lost in the Great Virginia City Fire of October 26, 1875. See Nevada Labor History. From left to right, Vice-President Rose Wolcott, President Craig B. Hansen and Immediate Past-President John Doran. The institutional memory of Communications Workers of America Local 9413 goes back well over 100 years when our predecessors went through the same thing. This body is being asked to repeat a blunder made by the Nevada Legislature 122 years ago. In 1879, the Ninth Session abolished the State Printshop and sent the work to outside contractors. Nevada history books tell a sordid tale of corruption and deception. Hard-earned tax dollars entrusted to the state by the citizens of Nevada ended up lining the pockets of avaricious contractors. Fortunately, the scoundrels were soon ousted. In 1881, the Tenth Session re-established the State Printshop. The Typographical Union Label represents craftsmanship at its finest. Our members have proudly affixed that logo to every measure before this body down to this very day, well over a century later. The people who work long and hard at the Nevada State Printshop are CWA journeymen who continue that long tradition of pride in their chosen craft by signing their work with that label. Our high standards are reflected in the products and services we provide to the people of the state of Nevada. On behalf of the more than 1,200 statewide members of the Communications Workers of America -- and all those who came before us to make us the longest-established union in Nevada -- I ask you to please vote a "strong no" on Senate Bill 564..
Samuel L. Clemens, perhaps our most famous member, wrote to his sister from Virginia City on April 11, 1863. The future Mark Twain told of turning down a quick profit on a mining claim he owned, "not because I think the claim is worth a cent for I don't, but because I had a curiosity to see how high it would go before people find out how worthless it is." You will hear a lot of equally questionable claims in the upcoming debate revolving around the buzzword of privatization. Our response will be rooted in another bit of advice from union man Sam Clemens: "When in doubt, tell the truth." The facts of this matter will show you the wisdom of opposing SB 564. Comments and suggestions appreciated. Sign up for news bulletins.